Back in June of 2000, Jeff Pearce was in town to play as part of the Gatherings concert series. Afterwards, he was nice enough to stop by STAR'S END for a live set on the radio show. The Light Beyond is the album that came out of this performance. Beyond this, it is difficult to accurately explain or quantify exactly what happened on the air that night. The music on The Light Beyond was drawn out through an extraordinary situation. The convergence of talent, the late hour and the immediacy of the moment acted upon Pearce as he produced gorgeous breathing waves of harmony with his guitar and assorted processing devices. Pearce attributes the rare fragility and intuitive contour of his performance to the space; the space he was physically playing in, the space his head was in and the space his music was being broadcasted out into. The album is indexed at four points but the music flows continuously from beginning to end. The musical areas explored gradate from pastel cloud obscured sunsets to the soft velvet cloak of night. Pearce uses delicate timbres within sympathetic harmonies to convey his benevolent message. But with track titles like "Migration of Souls" and "A Farther Shore", one can easily deduce that this album is dealing with more than just sound and music. 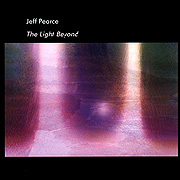 The Light Beyond is Jeff Pearce's continuing attempt to comprehend his own relationship with the infinite.